With the 2017 season just around the corner, we take a look back at our analysts' stellar 2016 performance. 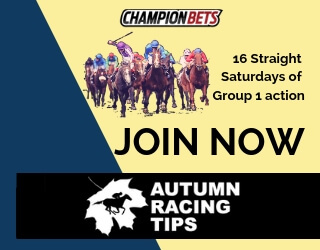 We achieved an excellent strike rate of above 60% on line bets and totals bets, which is well above the often desired strike rate of 55-58% that many professional punters look to achieve when betting on $1.90 propositions. The at-odds bets category is mainly comprised of betting on underdogs head to head (H2H), which we often do when we bet on the plus line. While the turnover on these bet types was small, they actually had the highest return on investment of the three main betting categories. It is in everyone’s nature to like winning. It was a pretty smooth year for followers in that respect, as we had more than double the number of winning weekends (19) to losing weekends (8). Furthermore, our winning weekends won more, on average (+7.79), than we lost on our losing weekends (-5.22). Finally, our best weekend (+18.64) won more than double the loss of our worst weekend (-8.31). Combining all of this, we can see in the graph below that it was a low volatility season, with the biggest drawdown being 14.12 units (over rounds 7 and 8). 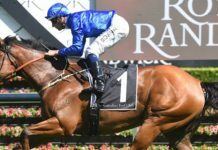 The following article will give some more detailed breakdowns of our betting season, delving into which teams we made or lost the most money on, and which bet types within each of the above categories were most successful. If you have any questions about the upcoming 2017 season, feel free to get in touch with us via email and we will be happy to provide assistance. 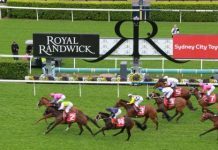 Before we dive into a more detailed analysis, it’s worth talking a little bit about when we release our bets, and the changing landscape of the AFL market that we witnessed in the 2016 season. We began the year by sending out our line plays on Thursday nights, when Pinnacle limits were about $6k, offering sufficient liquidity for clients to get set for a decent bet without the market going crazy at release. We also would release late plays on game day when bet limits were at their maximum of $27k. 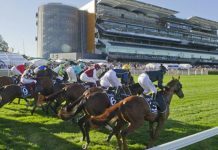 About 1/3 of the way through the year however, Pinnacle reduced their bet limits by about 60%, meaning that on Thursday night bet limits were only $2.5k. This forced us to change our release time to game day, where limits were at their maximum ($11k). While this does result in value being lost at times, we believe this is the only option for the sustainability of our service. If we released on a Thursday into $2.5k limits, followers who can only get set at Pinnacle would not be able to get their full bet size on before the price moved, and as a whole our release would cause the market to move aggressively. By waiting until game day, we did not see aggressive moves by Pinnacle at our release time, meaning people should have been able to go close to matching the odds we quoted at release (if not bettering them at corporate accounts, for those who can get on there). For totals betting, unfortunately the limit reduction basically killed the totals betting market, as Pinnacle max limits were a miserable $900 on game day. Unless something changes, unfortunately this means that unless people have corporate accounts, they shouldn’t expect to be able to go close to matching what we quote on totals bets. We expect another good year from our line and H2H betting model however, and with the big limits on game day, subscribers who are limited to using Pinnacle should still expect a big 2017. The following table gives a more granular breakdown of our line betting record by specific bet type. We have split the bets into plus lines, minus lines, and H2H bets (on pick games), and furthermore whether the plus or minus line was 0-30 or greater than 30. While this results in relatively small sample sizes for each category, it is encouraging to see that we were profitable across all 5 classifications, indicating our model did not have any losing biases towards a particular bet type. Another snapshot we give below is a breakdown of results by backing each team. We can see from the table below that our model was much more bullish on certain teams this year than others. 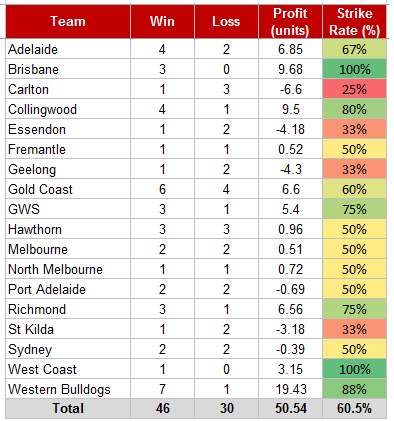 Teams the model favoured in terms of number of bets were GWS (14), Brisbane (8), Gold Coast (8) and Western Bulldogs (8). The least popular teams for our model were Fremantle, Geelong and Richmond, each of whom we only bet on once all season. 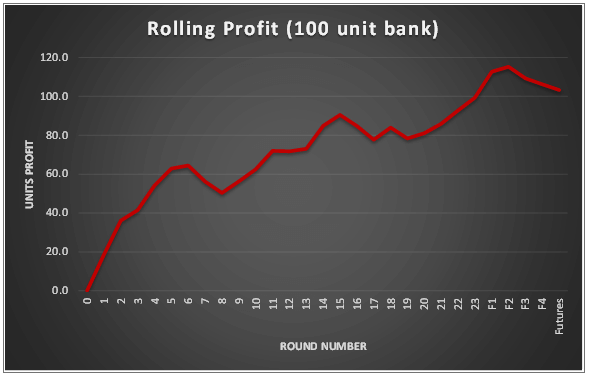 In terms of the actual profit we yielded betting on each team, the best results in units were Gold Coast (+18.57), Western Bulldogs (+14.09) and North Melbourne (+13.68). 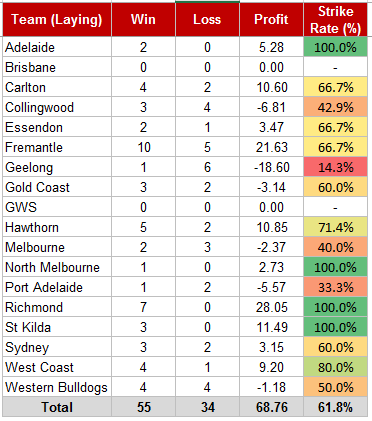 On the flip side, there were only three teams that we did not yield a profit on for the season, which were Brisbane (-23.63), Adelaide (-9.66) and Geelong (-3.00). Opposite to backing teams, laying is where you bet against a team. This gives another interesting look at our model and notably which teams the model disliked (bet against frequently). 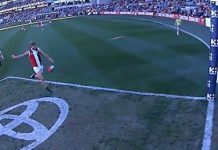 Our favourite lay for the year was Fremantle, who we opposed a massive 15 times (for a 10-5 record). Other teams we bet against often were Western Bulldogs (8), Collingwood (7), Geelong (7), Hawthorn (7) and Richmond (7). Interestingly there were two teams we did not bet against all season, GWS and Brisbane. 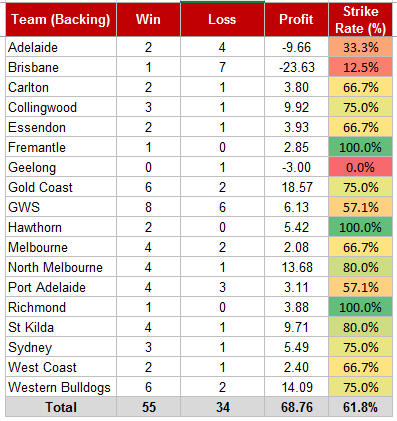 When we look at the profit figures in units from betting against teams, our most successful lays were Richmond (+28.05), Fremantle (+21.63) and St Kilda (+11.49). The teams we did not have success betting against were Geelong (-18.60), Collingwood (-6.81) and Port Adelaide (-5.57). As we mentioned in our betting markets section, the max bet limit on Pinnacle totals dropped from $2.5k to $900 early on in the 2016 season. 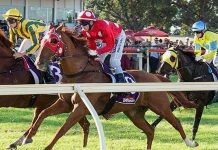 This meant that it became increasingly difficult for us to be identify value in the markets, as small bets would lead to Pinnacle moving aggressively, and other bookmakers usually copy their move not long after. For this reason, it was our lowest totals volume on record for a season. Despite this, we still managed a record of 23-15 on the totals bets, yielding a handsome 25.27 units profit. 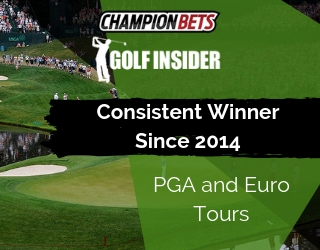 2016 saw us bet on more over bets than unders, with both categories being profitable. When we look at which teams saw us yield the most profit on totals bets, we don’t need to look much further than the Western Bulldogs. We went a huge 7-1 on totals in matches they were involved in, notably all betting the under. We also had a good record betting on overs in the frequently high scoring Brisbane games. Note that in the above analysis each bet gets double counted (once for each team that was involved in the match), resulting in a double count from the earlier figures we quoted. We hope you enjoyed the analysis in this article, and we are excited to get you on board for the 2017 season. We have been hard at work calibrating our player ratings, and we are set for another big year. Given that it was a relatively active free agency period, and we have Essendon players returning, we are hoping our players ratings approach will handle the early rounds better than the market, and we can get off to a flyer like we did in 2016. 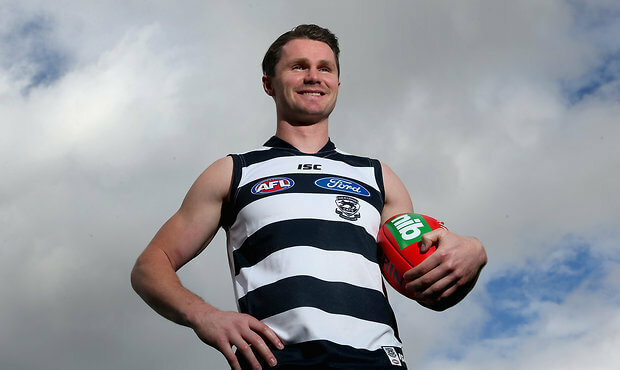 Click below to join the 2017 AFL package for $799 which includes the pre-season.